Climate activists and civil society members disrupted an industry-backed meeting promoting false solutions at the U.N. climate conference in Lima on Monday. For those familiar with the annual Conference of Parties to the U.N. Framework Convention on Climate Change — the international talks theoretically tasked with creating guidelines by which the world’s nations can seriously limit greenhouse gas emissions — the presence of the planet’s largest fossil fuel companies at this year’s gathering in Lima, Peru might seem anathema to the task at hand. Yet, Shell, Chevron and ExxonMobil, linked not only to continued fossil fuel extraction and carbon emissions, but also a slew of human rights abuses in the Global South, have a regular presence at international climate gatherings. Fittingly, activists and civil society groups present at this year’s Conference of Parties, or COP 20, flooded a side meeting on Monday hosted by the industry-backed Global CCS Institute (the CCS stands for carbon capture and sequestration) with a barrage of questions and social media pressure. The panel’s original title, “Why Divest From Fossil Fuels When a Future with Low Emission Fossil Energy is Already a Reality?” is in itself a sign that the world’s top polluters are on the defensive, responding to the growing, international movement to divest major institutional investors’ stock portfolios from the fossil fuel industry. 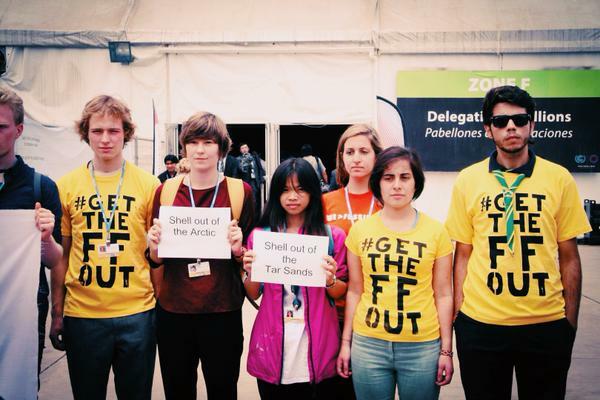 Some activists participating in the action wore T-shirts emblazoned with the words “Get the FF Out,” calling on the fossil fuel industry to be removed from the U.N. process entirely. In a press statement, executive director of Environmental Rights Action/Friends of the Earth Nigeria Godwin Uyi Ojo said that Shell “[has] no place in Nigeria, or in the climate negotiations, and there is no place for dirty energy in a sustainable energy future.” Other leaders from the frontlines of extraction and climate change also spoke out against the industry’s presence at the conference before entering and interrupting the small panel. As Sabido noted, fossil fuel companies have been some of the talks’ major advocates for a geo-engineering process called carbon sequestration and storage, by which carbon is captured either from the atmosphere or a site of refinement and stored elsewhere, more than likely deep underground in the Global South. The idea is to keep carbon from entering the atmosphere — and to continue burning fossil fuels at current rates. As a solution to climate change, CSS is an obvious favorite of companies like Chevron and Shell, creating a technical, market-friendly “quick fix” to international pressure in lieu of, say, binding resolutions, “loss and damage” reparations for climate impacts, or a global carbon tax. In an interview last year, climate scientist Kevin Anderson, the former director of the United Kingdom’s Tyndall Center, said that the fact that geo-engineering schemes like CSS are being considered at all, “only adds to my concern that orthodox economics and political cowardice are unduly influencing science.” In light of Anderson’s assessment in 2012 that long-industrialized nations like the United States and Australia will need to curb emissions by 10-20 percent per year to limit temperature rise to 2 degrees Celsius and avert total climate catastrophe, the discussion at COP 20 talks of “solutions” that don’t consider capping emissions at their source is especially troubling. The panel was part of a series hosted by the International Emissions Trading Association, which also receives considerable financial support from fossil fuel companies and groups like the World Coal Association. Similarly to CSS, emissions trading itself would allow, and potentially even encourage, continued fossil fuel use, creating new products out of carbon emissions that can be traded like other commodities. It would also generate profitable “carbon markets” out of forests, like Peru’s Amazon, whereby countries and corporations could “offset” emissions by planting trees thousands of miles away under a controversial program known as Project REDD. There are more than a few false solutions being peddled around Lima this month, but also a couple genuine ones. Most simply, movements and civil society groups are demanding world leaders take the advice of climate scientists rather than fossil fuel industry lobbyists. Looking ahead to COP 21 in Paris next year, it’s clear that it will take popular pressure — not industry goodwill — to implement even the most basic policy shifts necessary to avoid a collective worst-case scenario.